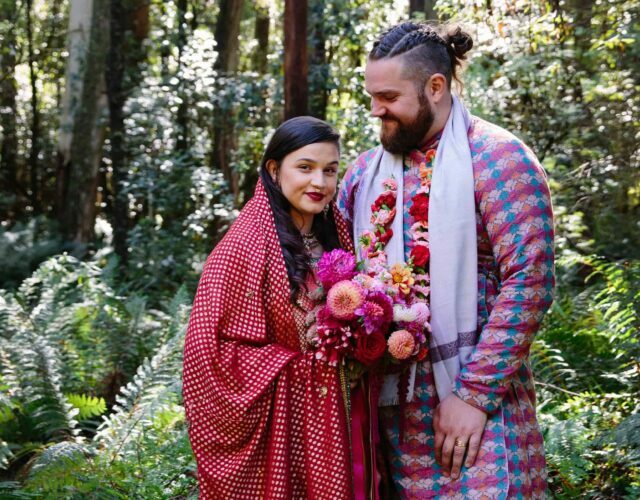 Anita and Joel met in a Metallica moshpit, of all places, and their shared love of metal is matched only by their love of the great outdoors. 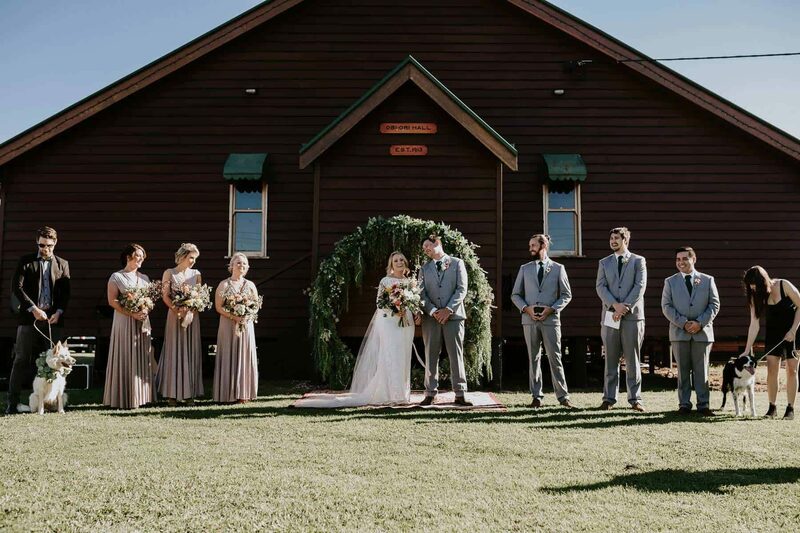 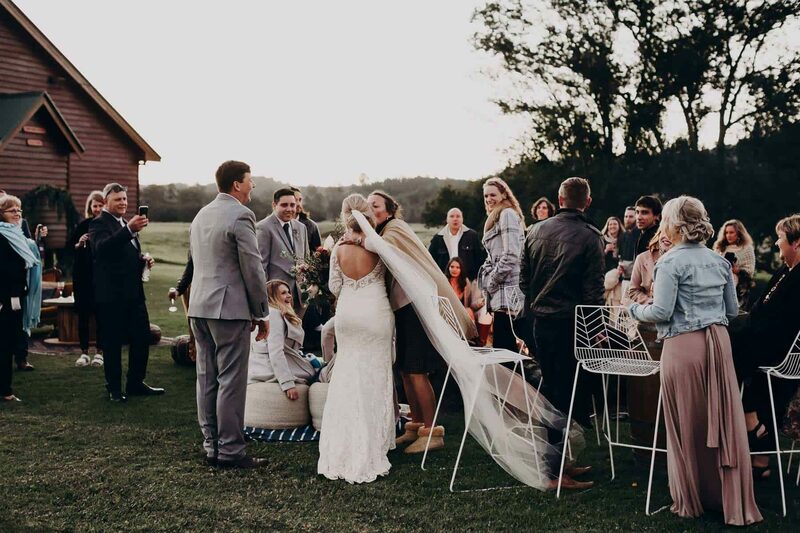 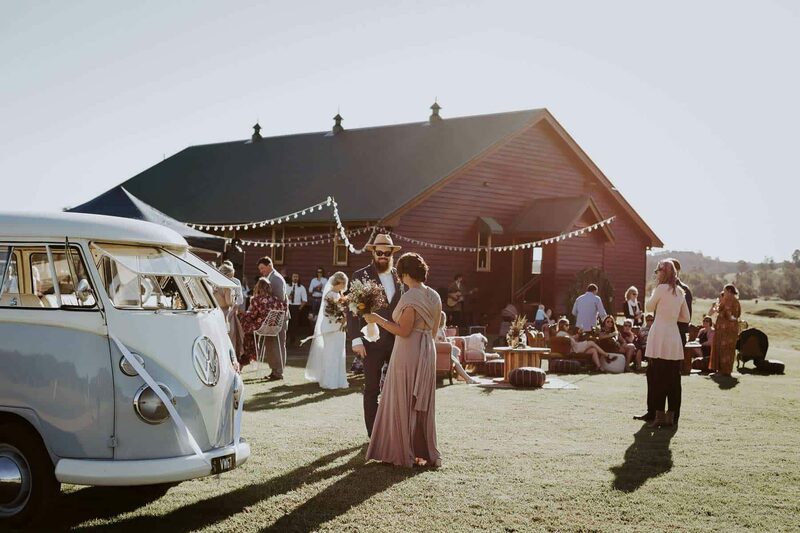 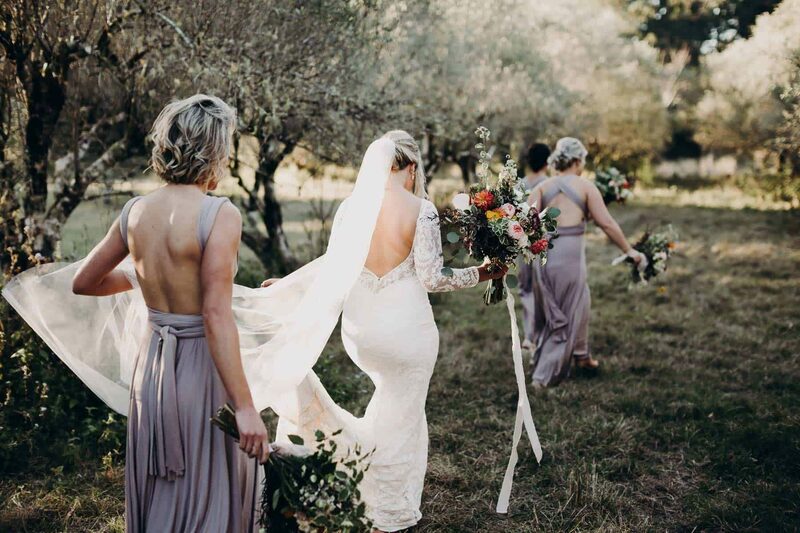 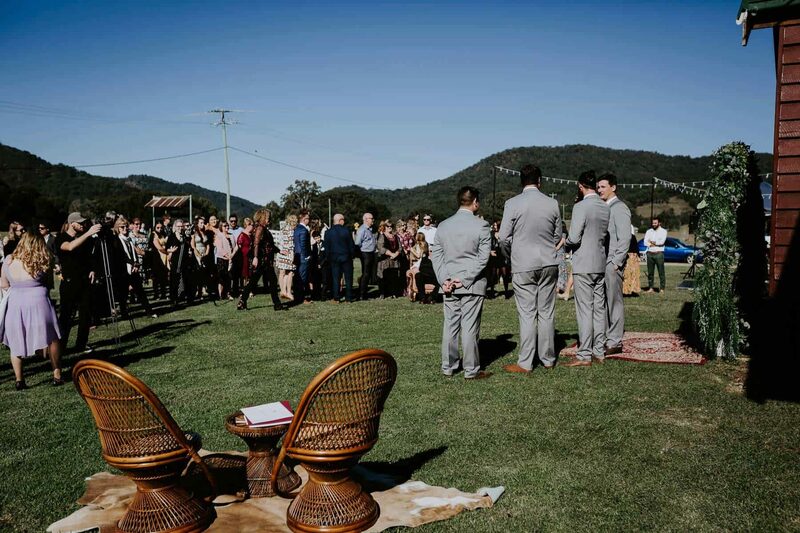 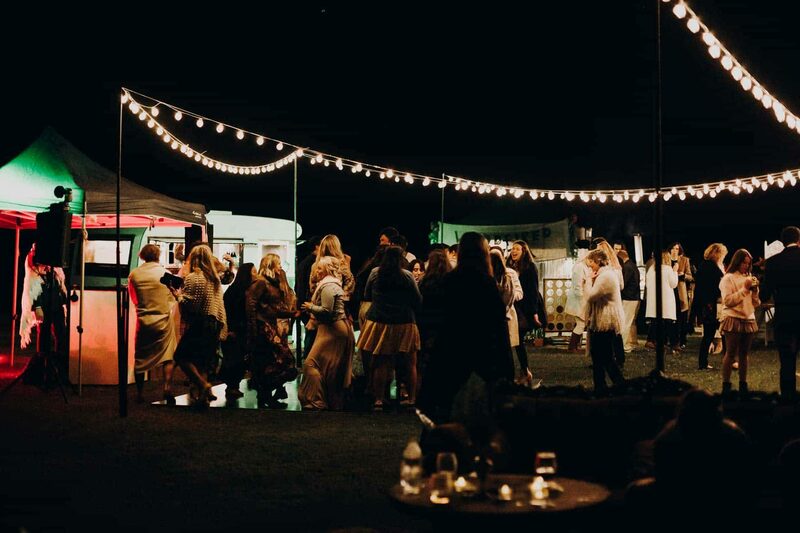 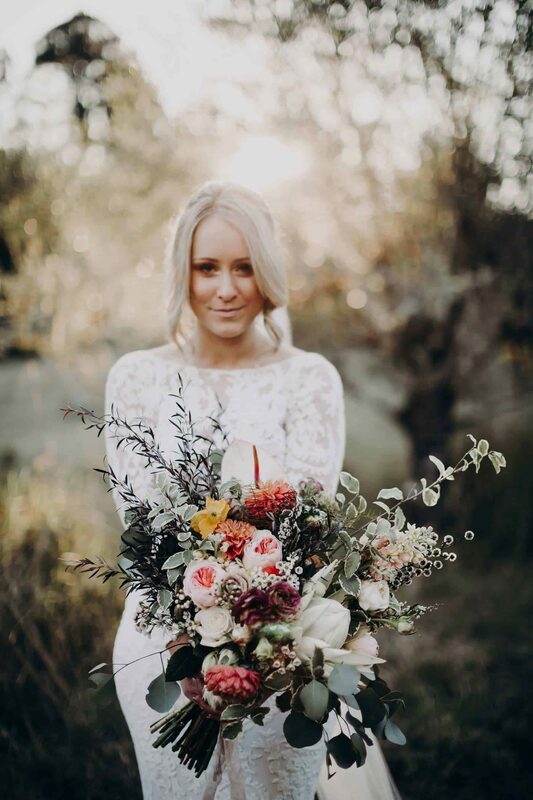 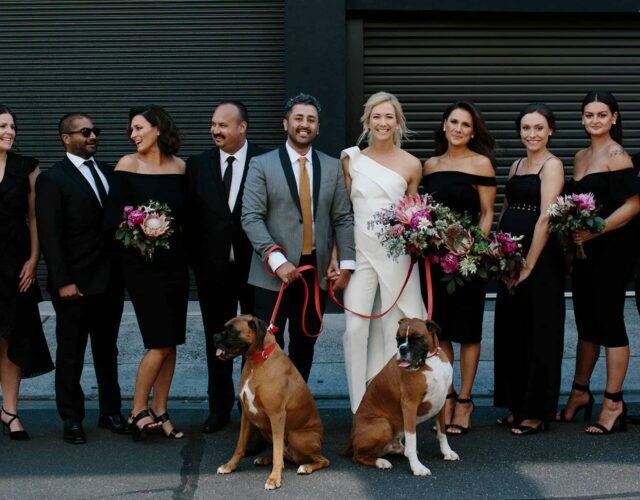 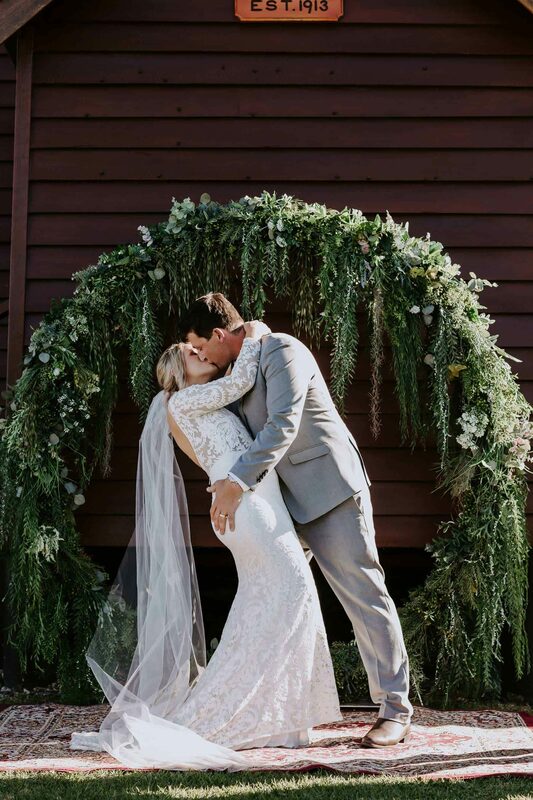 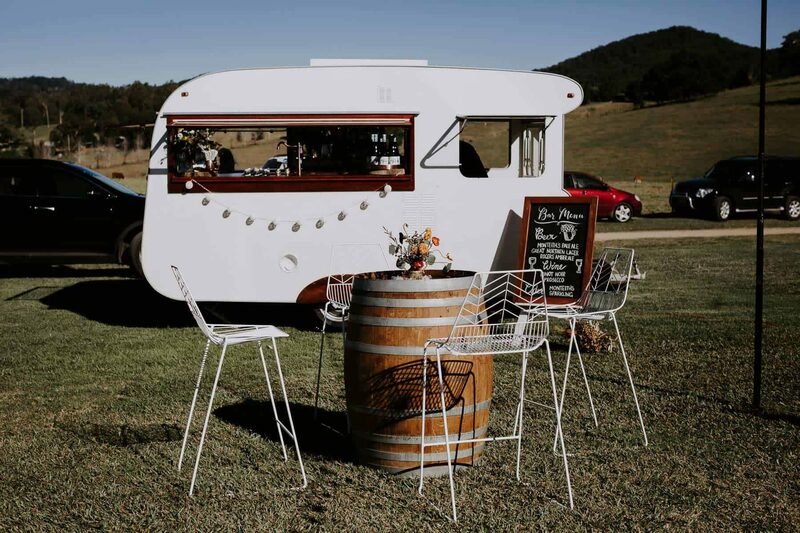 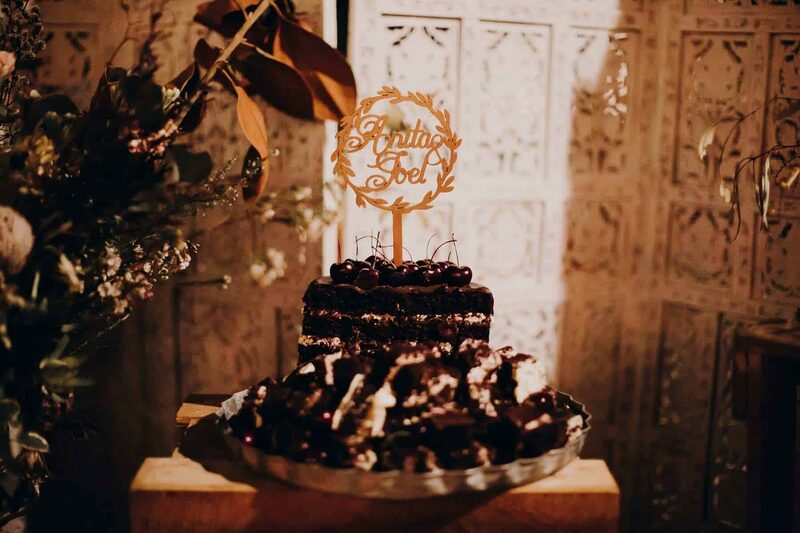 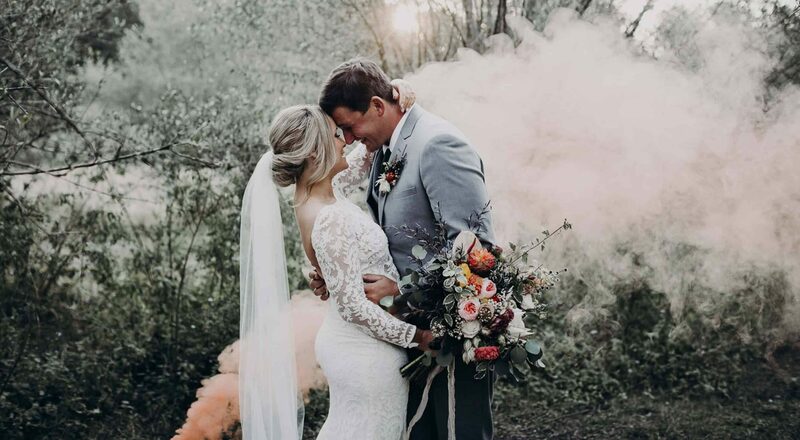 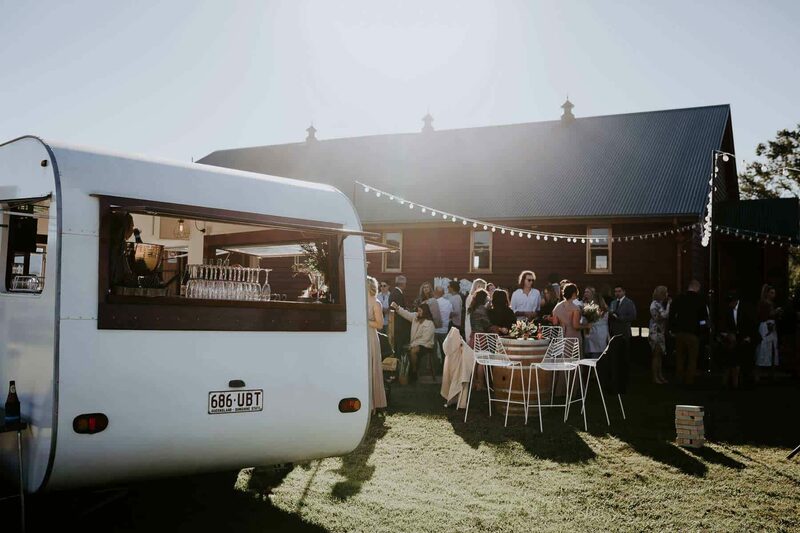 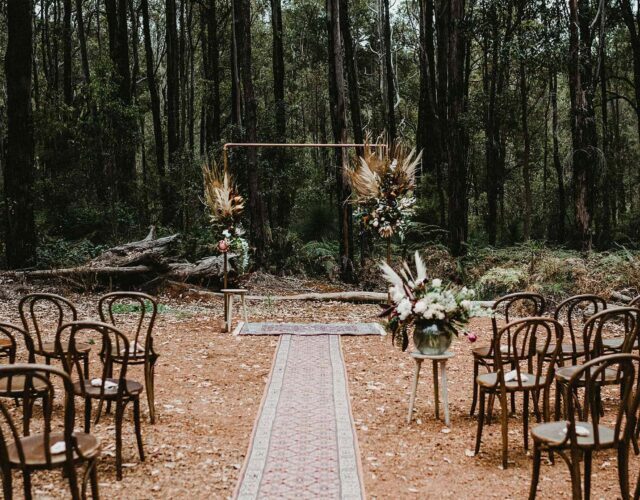 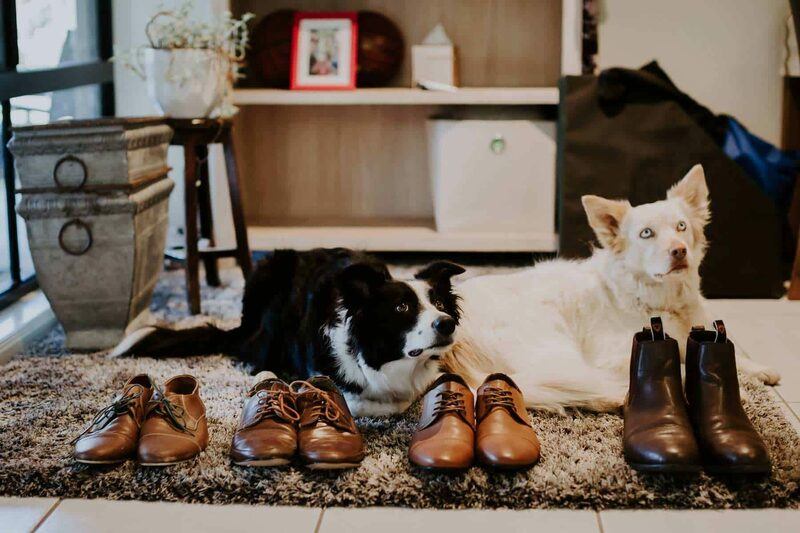 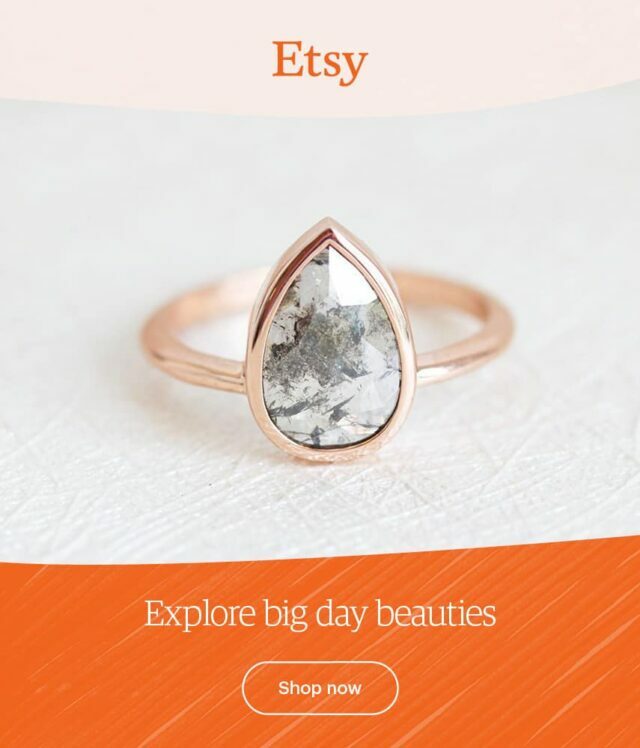 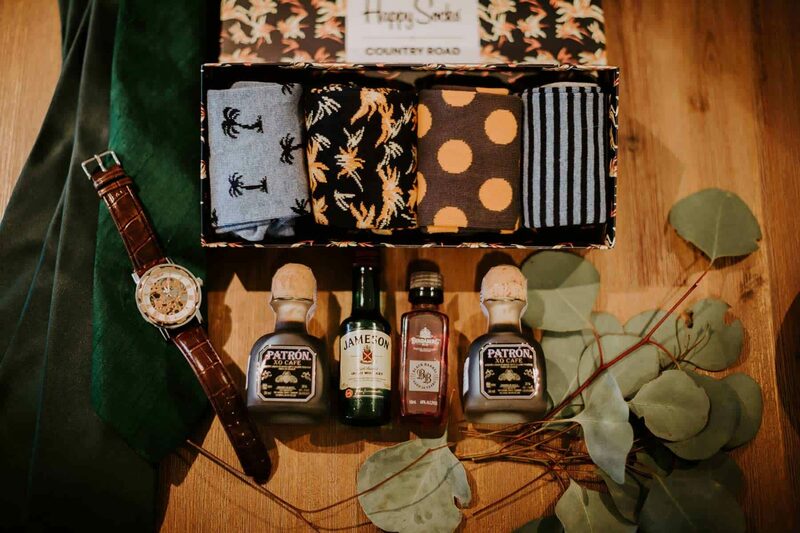 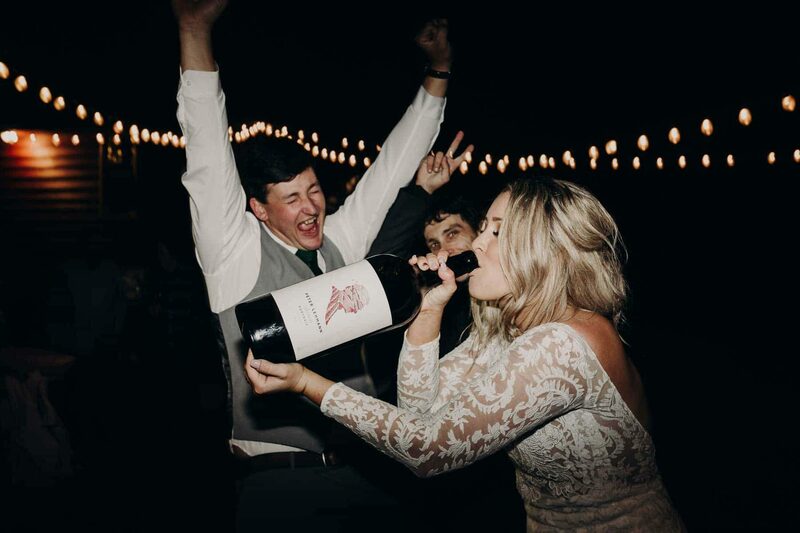 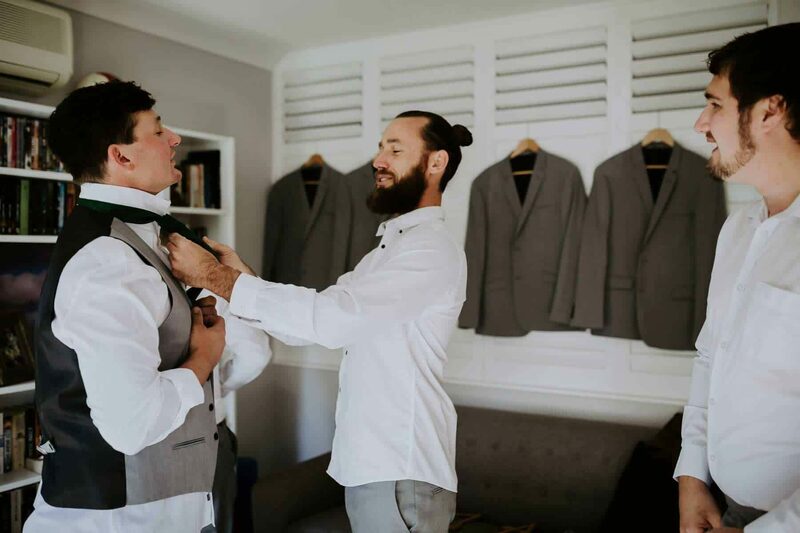 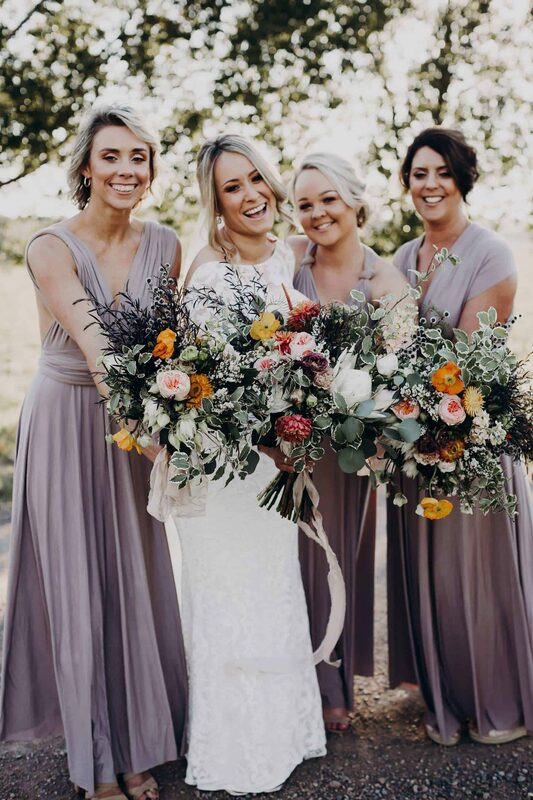 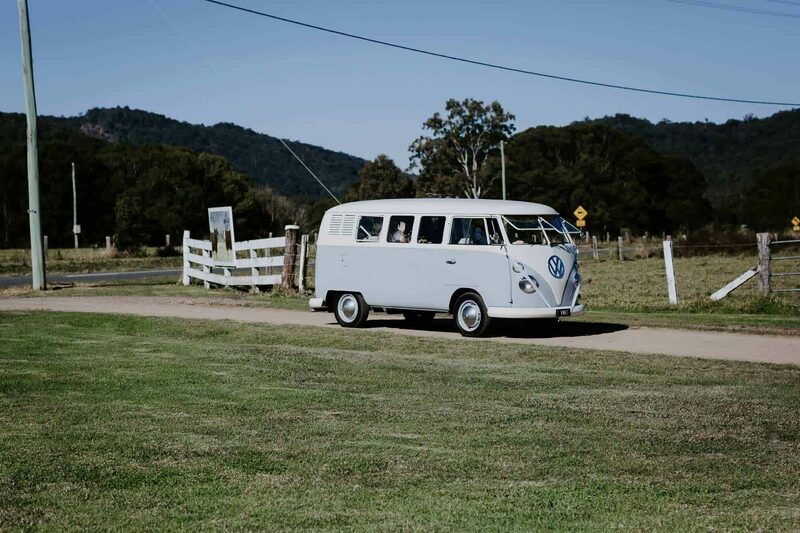 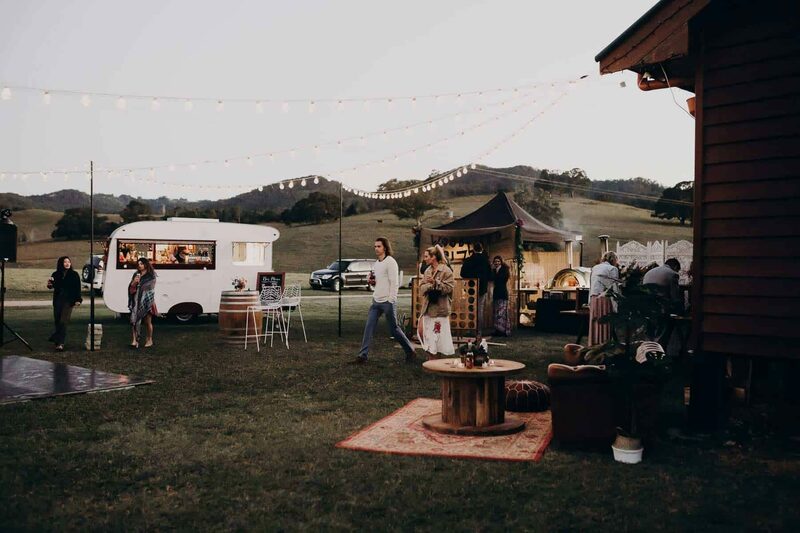 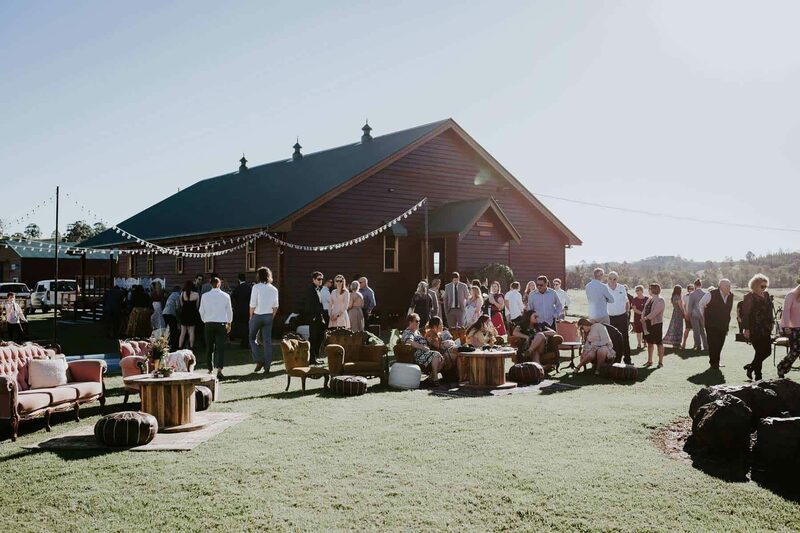 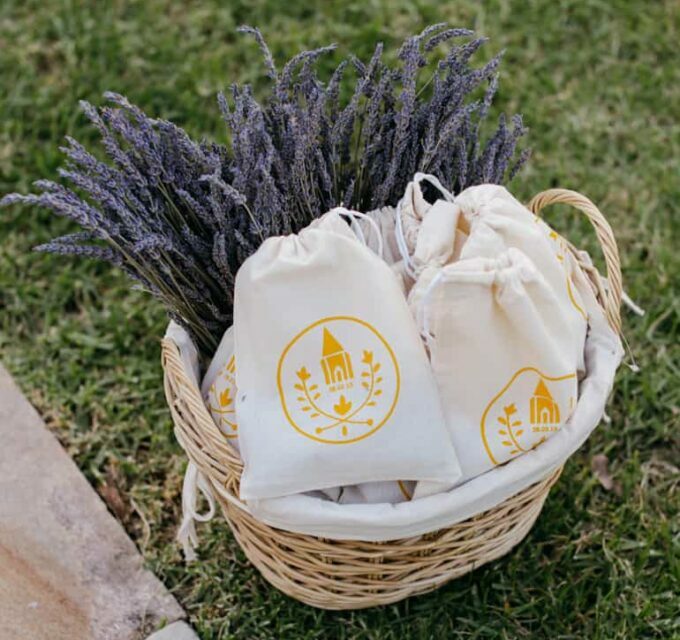 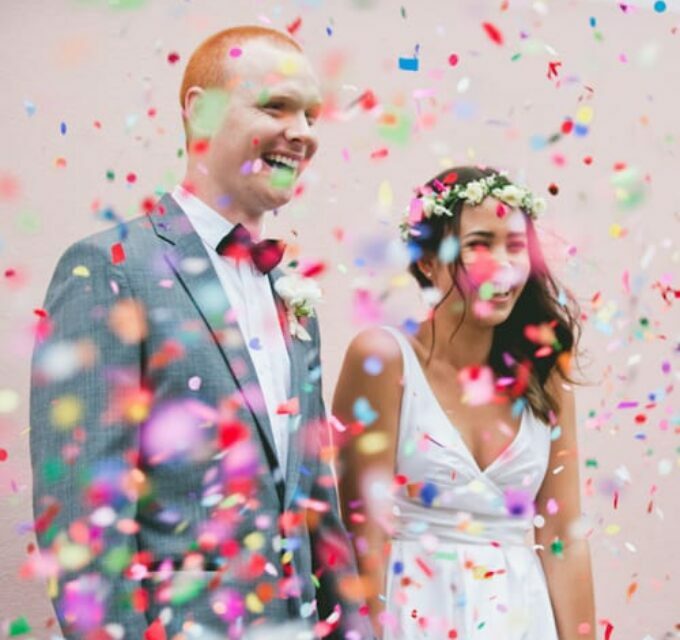 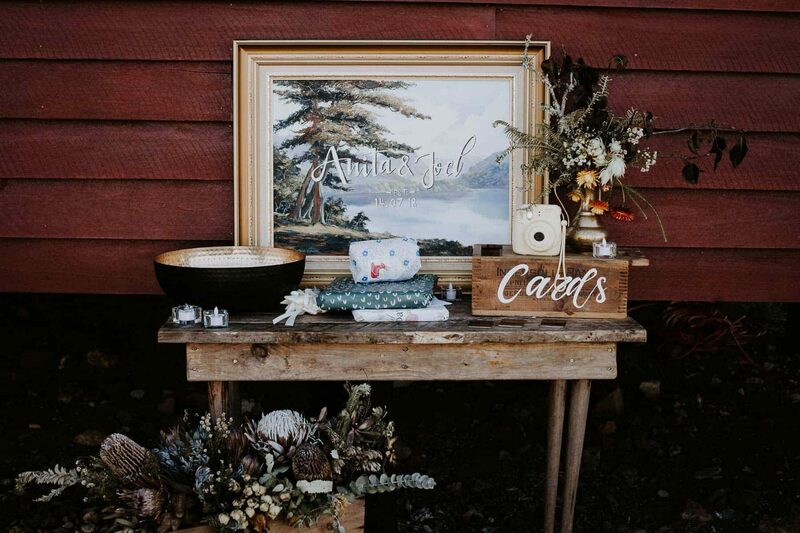 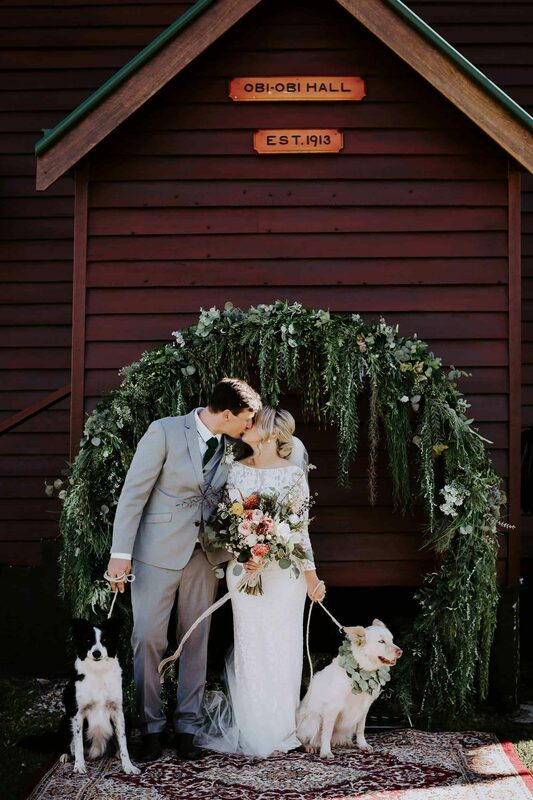 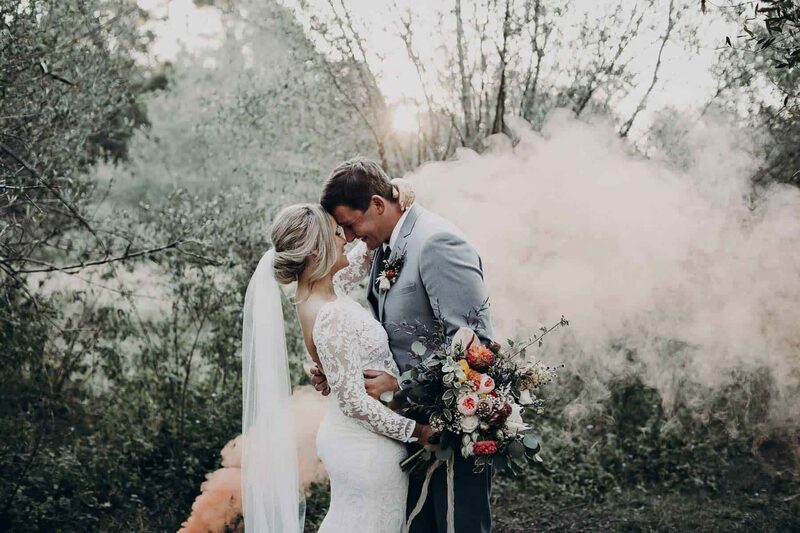 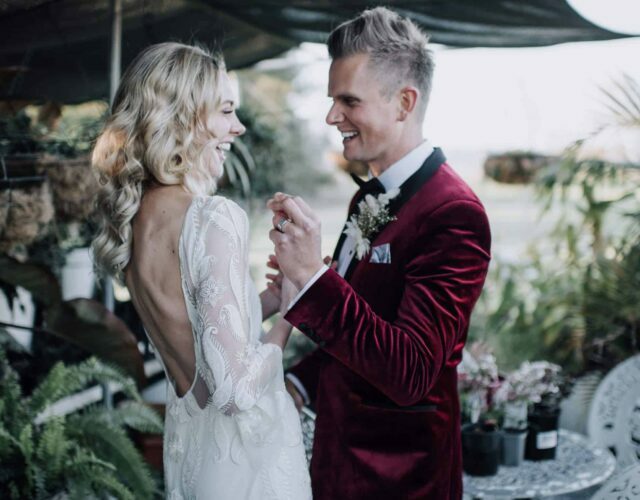 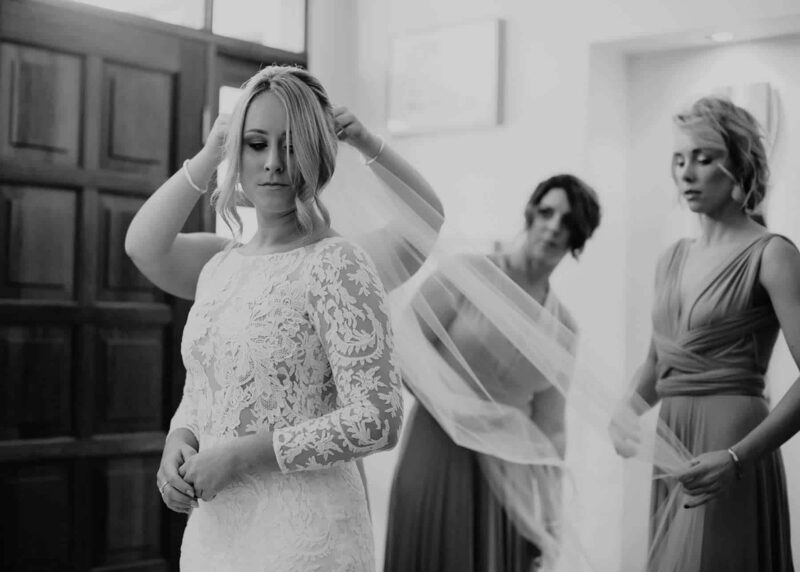 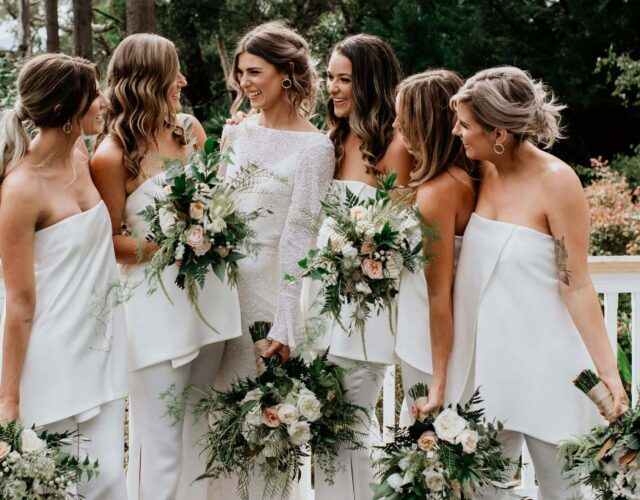 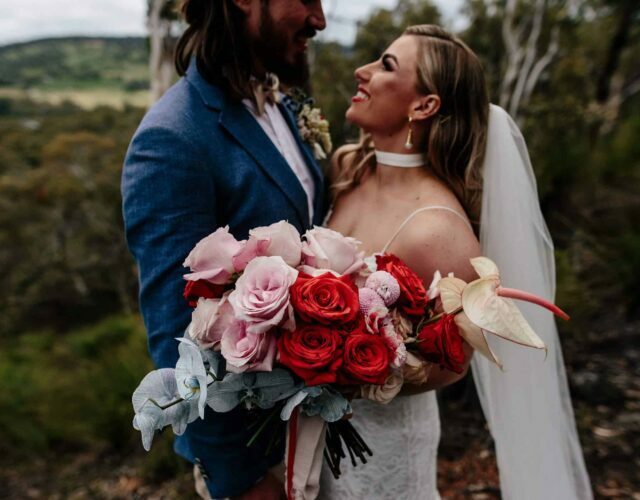 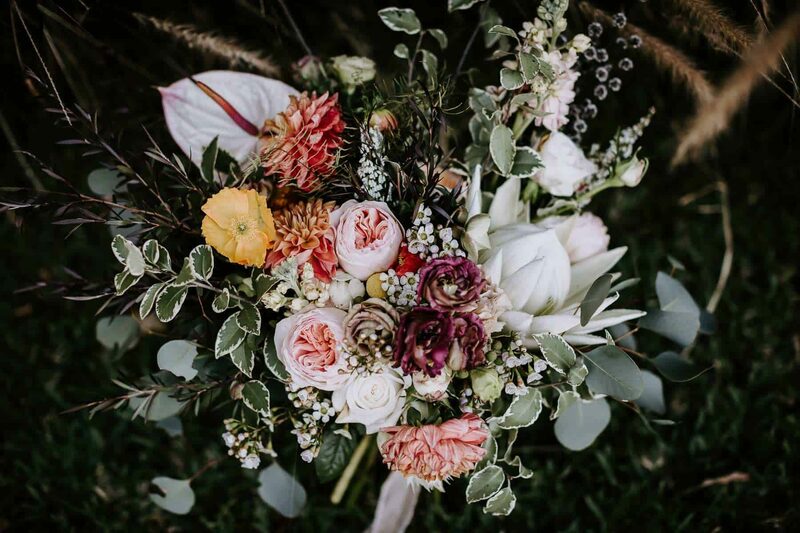 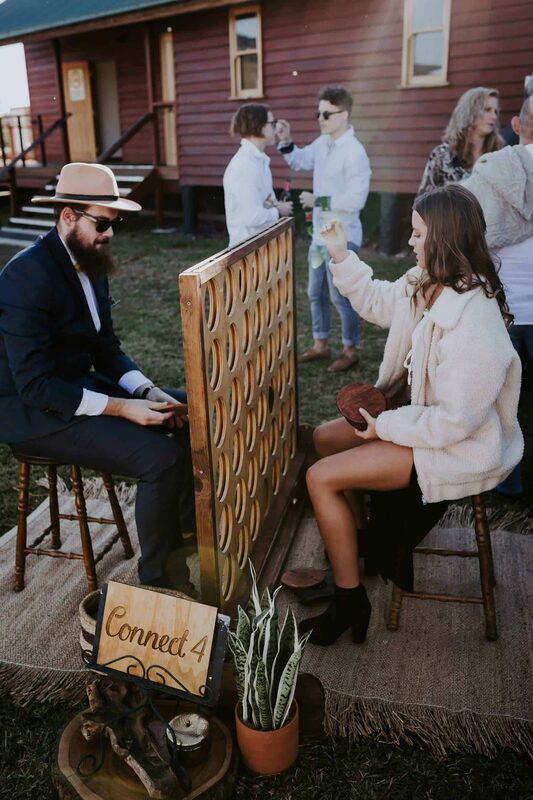 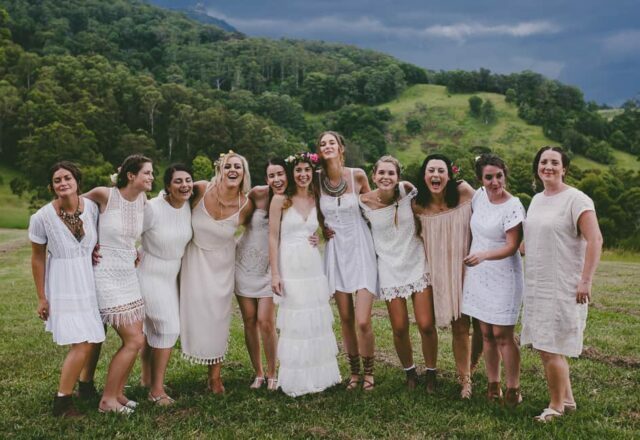 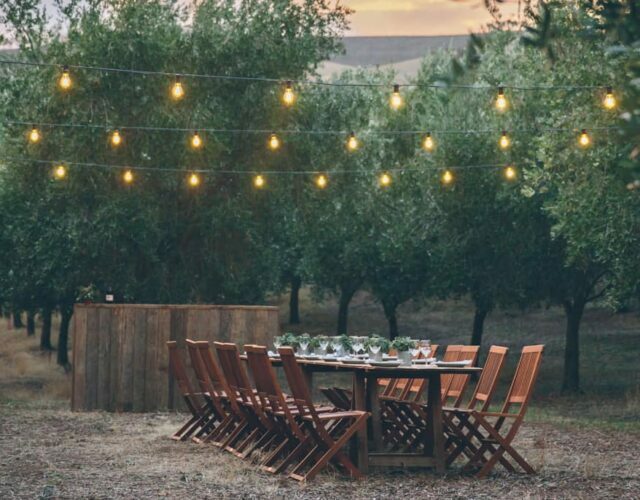 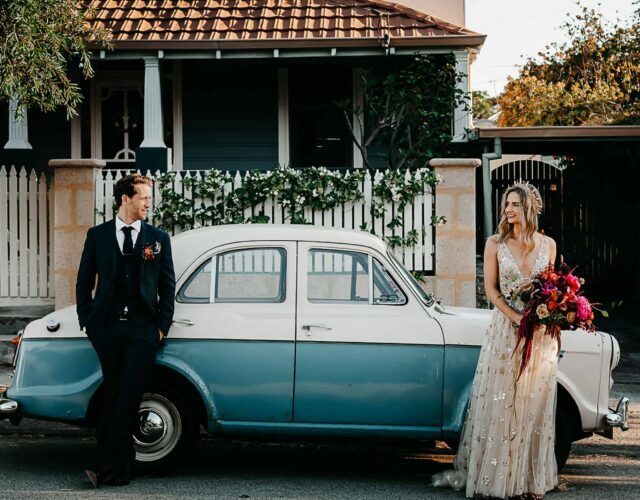 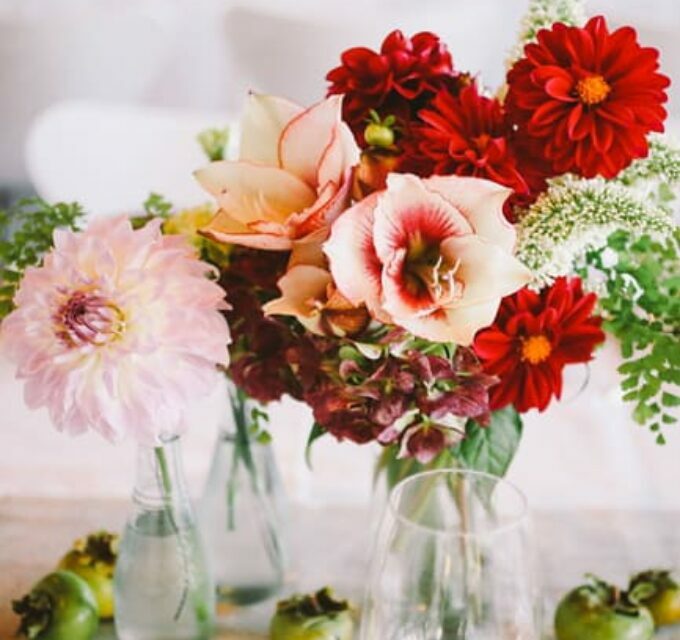 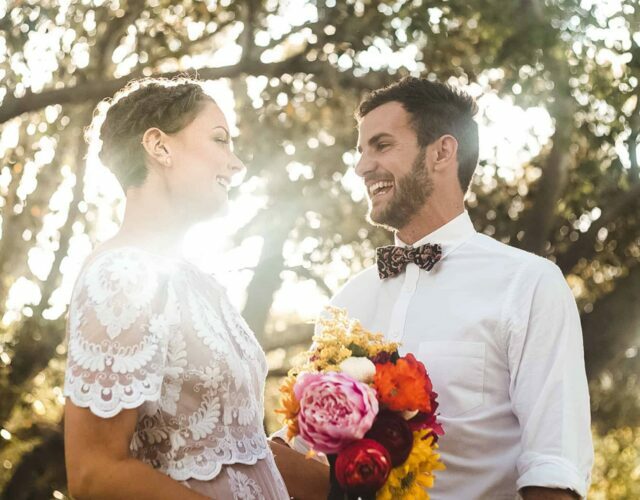 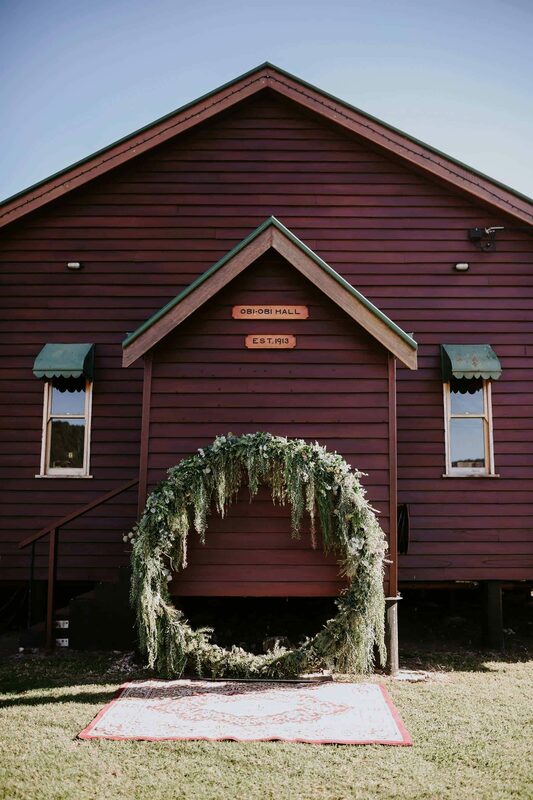 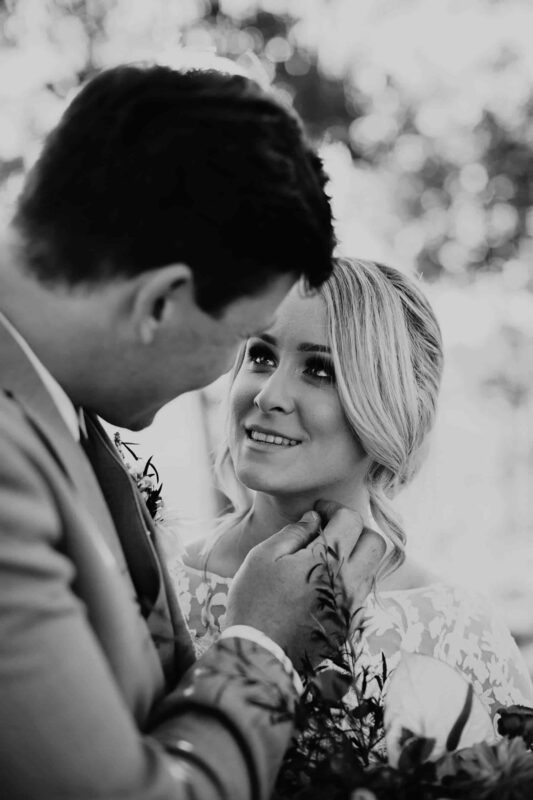 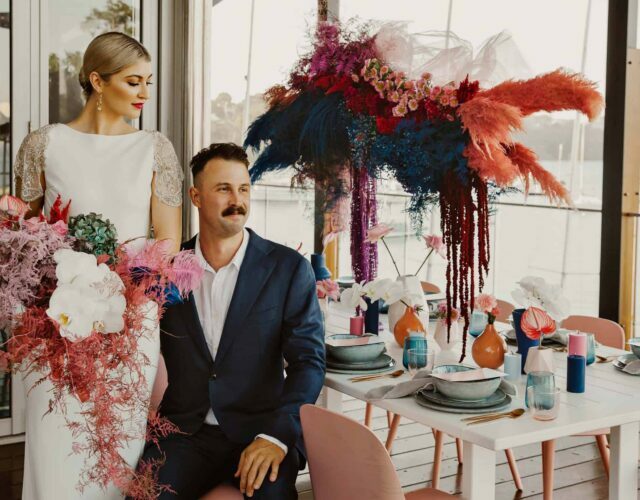 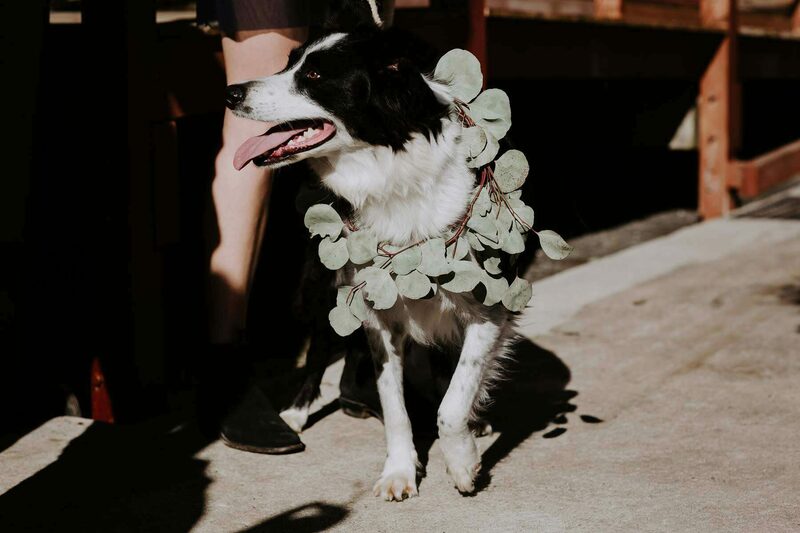 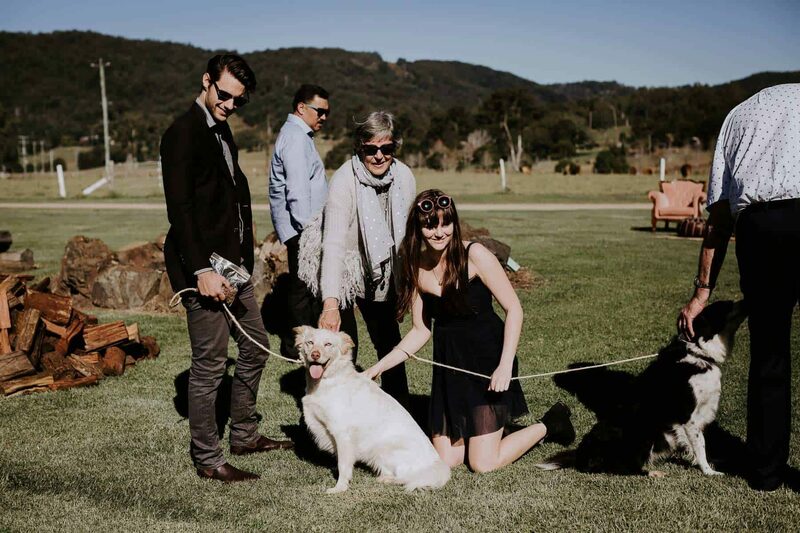 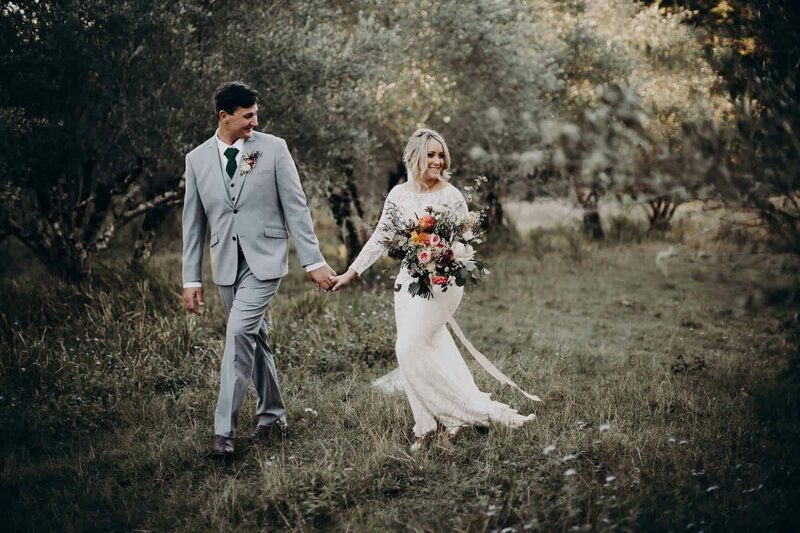 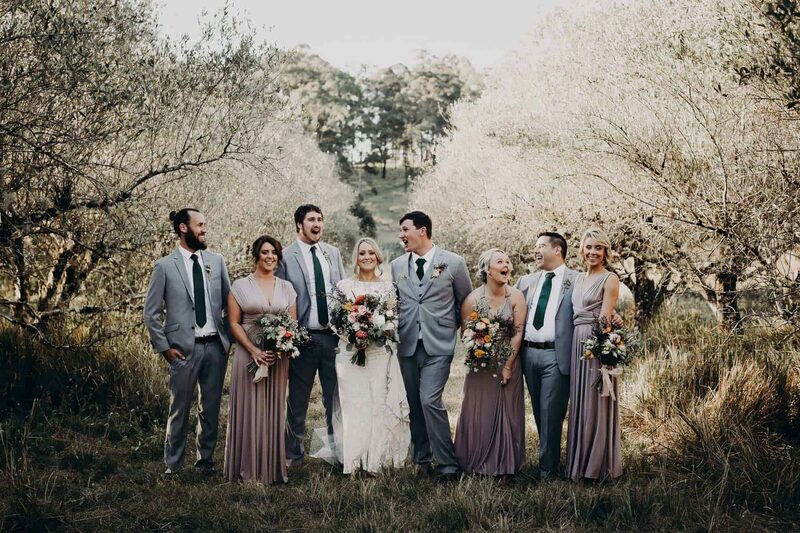 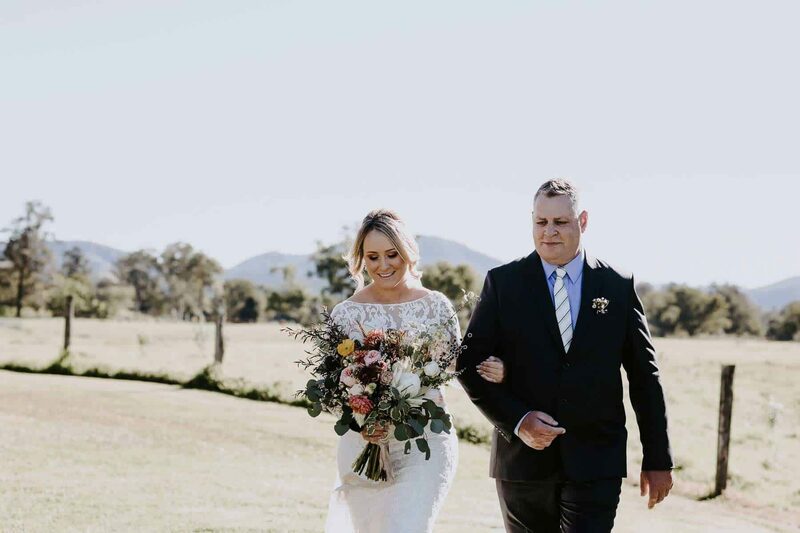 Obi Obi Hall in Queensland’s beautiful Obi Valley was top of their venue wish list, and when they discovered it was fully booked, the pair put their plans on hold for a year to secure a spot. 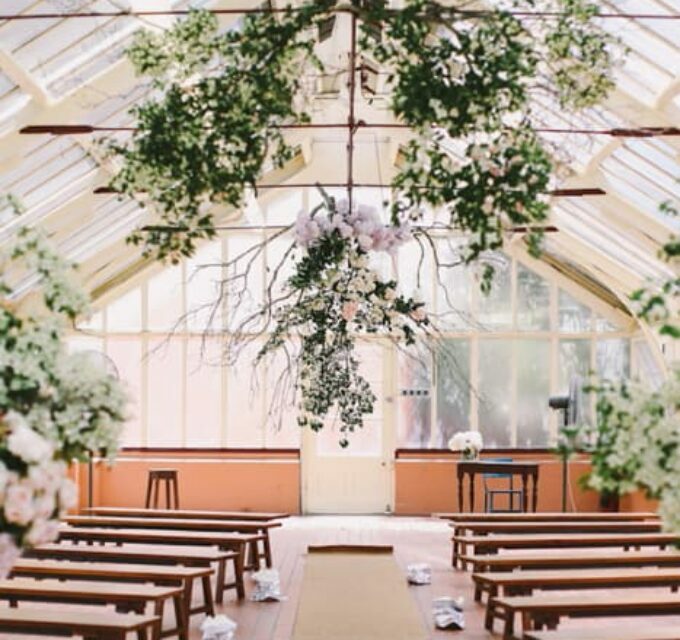 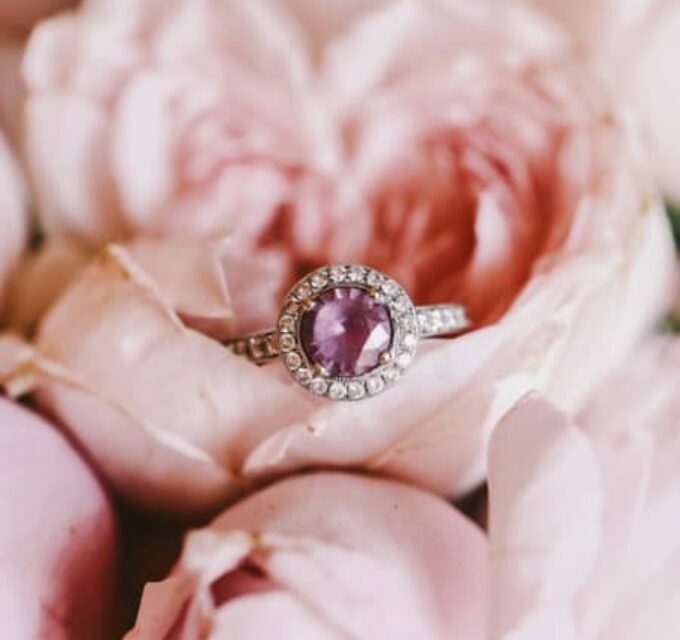 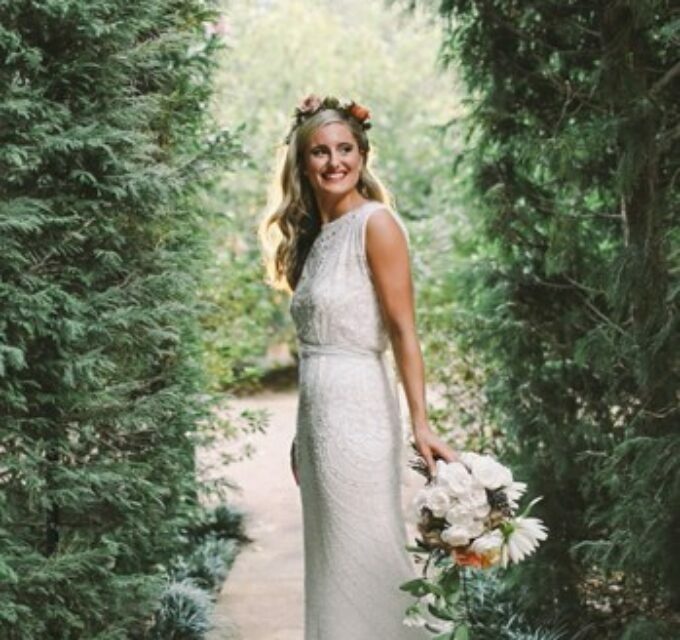 From these gorgeous snaps by Bonnie Jenkins, we can see why they fell so hard for the luminous setting. 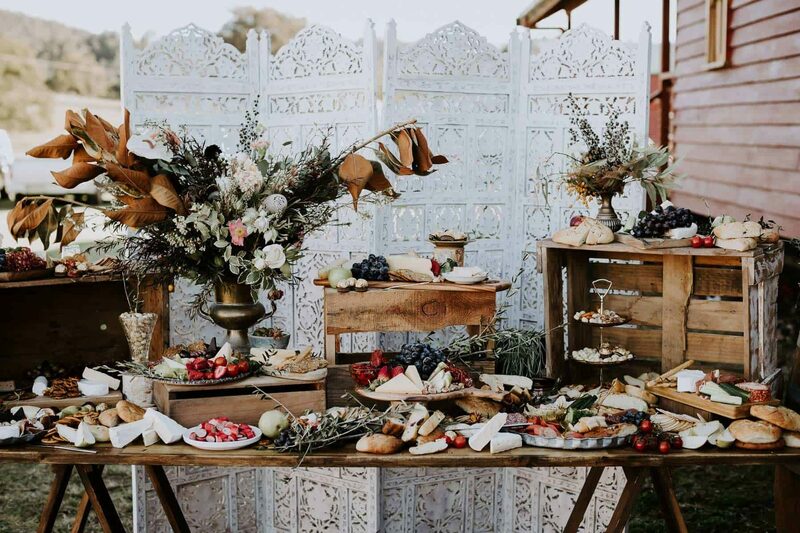 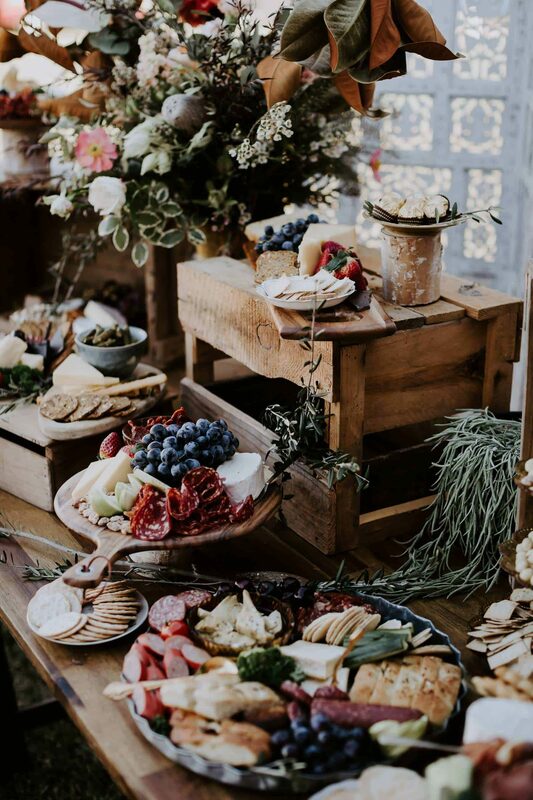 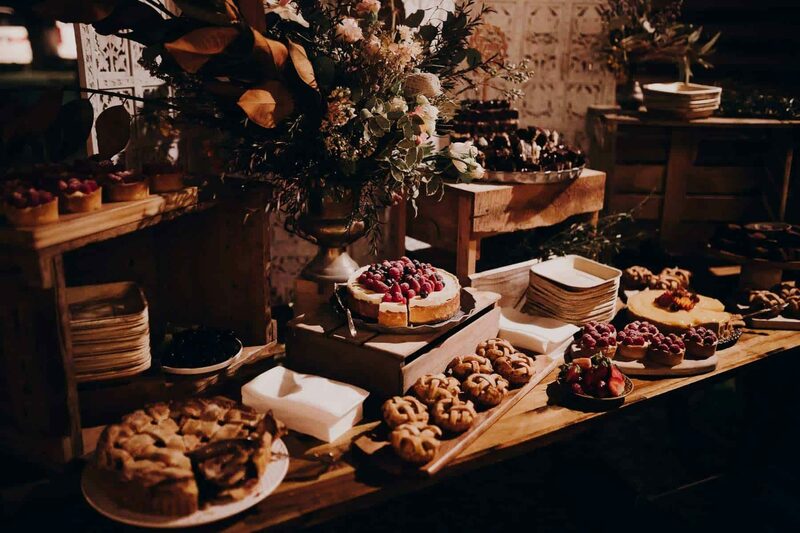 After the I do’s, guests tucked into an incredible grazing table put together by two of the bride’s friends. 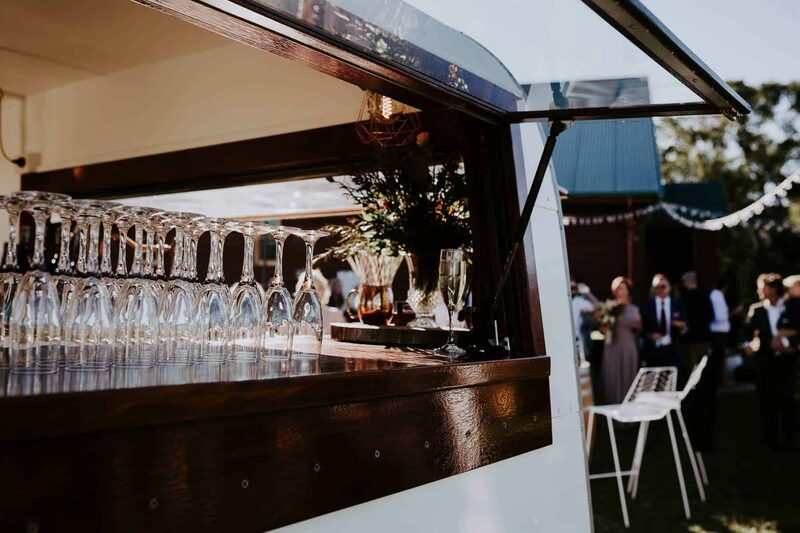 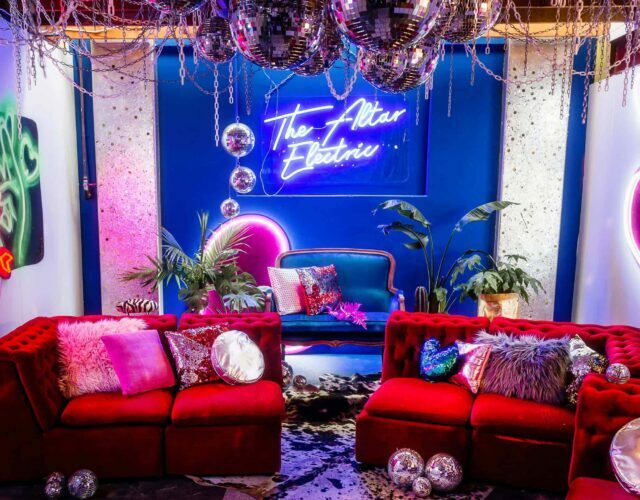 Drinks were served from retro caravan, Vintage Bondwood Bar, as guests lounged on sofas and mingled in the golden sunlight of the afternoon. 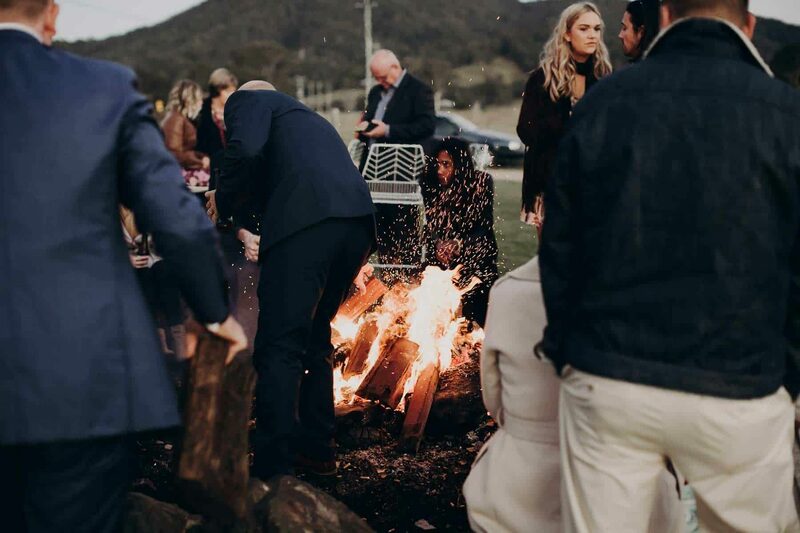 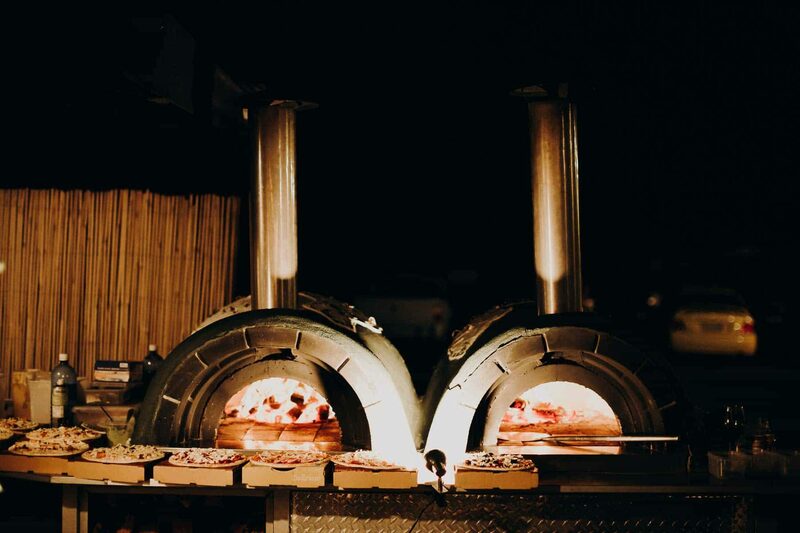 Wood fired pizzas by Jungle Oven were enjoyed around a massive bonfire, and as the temperature dropped to a rare Sunshine Coast minus two degrees, the only way to stay warm was to bring some serious heat to the d-floor! 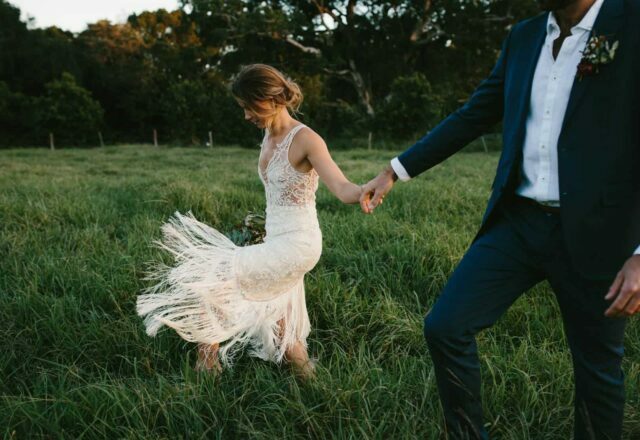 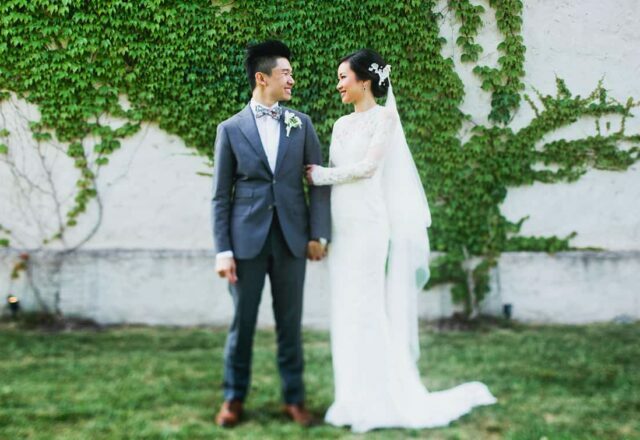 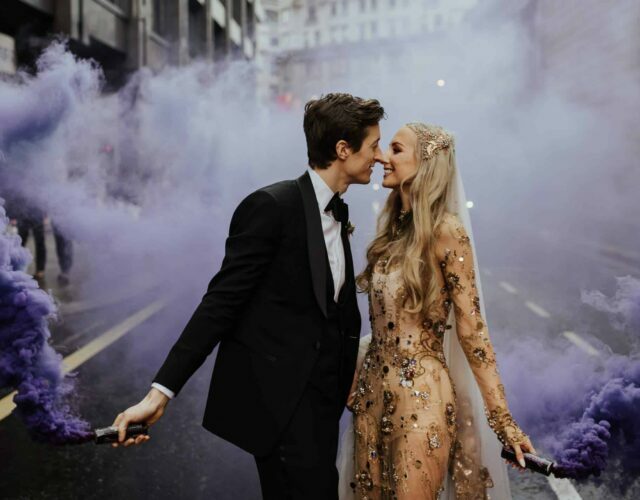 Anita wore a custom lace gown by Marilyn Crystelle Bridal, with essential stretch for a night full of shimmying. 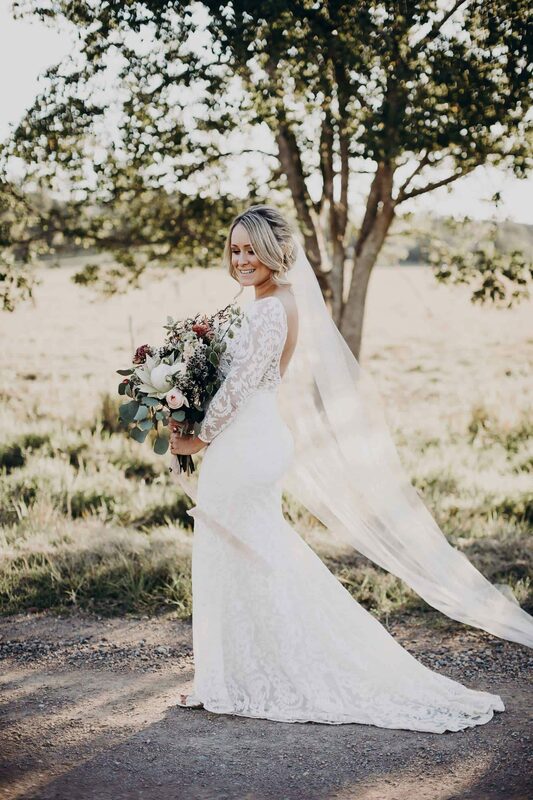 She paired it with a full length veil for a little drama.